A low, branching shrub, 1 to 2 feet high from a horizontal or spreading base and woody rootstock, the branches erect or nearly so, usually leafless below, the young parts glandular and pubescent. Leaves oblanceolate or oblong-obovate, blunt, entire, firm, green on both sides, shining when mature, sparingly hairy or smooth, resinous or glandular, 1 to 11/2 inches long, sessile or nearly so. 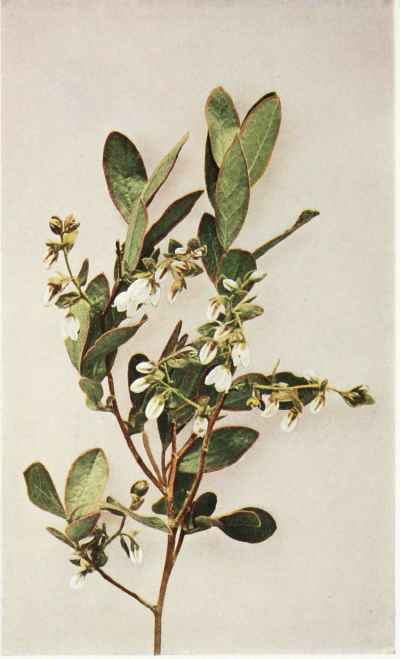 Flowers white, pink or nearly red, in rather long and loose racemes with numerous oval, leaflike bracts; corolla bell-shaped, slightly less than one-fourth of an inch long, the margin five-lobed; filaments pubescent. Fruit a black berry, without bloom, one-fourth to one-third of an inch in diameter and rather tasteless. In sandy or rocky soil, often in swampy depressions, Newfoundland to Florida and Louisiana, near the coast. Flowering in May and June.